Story: Tris bands together with a group of ‘Divergents’ against an increasingly powerful alliance which threatens to destroy her. Ahh, ‘Insurgent’.. Or should we call it ‘Mockingjay Again’?! It certainly feels like it is. In fact, if you don’t have the time to watch Mockingjay, you can always watch the first hour of Insurgent and it should pretty much fill you in on what you missed. The reality is, it’s easy to be harsh on Insurgent because it is a sequel to a film that surpassed so many expectations. Divergent introduced the world to Shailene Woodley and made her a bona fide star. It also confirmed Theo James’ status as a teen heartthrob, and continued Jai Courtney’s meteoric rise to stardom. What’s more, it was enjoyable for people of every age and seemed so different to the other young adult franchises garnering attention. Having said all of this, Insurgent kinda disappoints. Having not read the book, it’s easy to cast judgment on a lack of originality or stimulating content but we have to acknowledge that this might be the fault of the novelist, not those behind the film. Was it so wrong to expect something a little different to what appears to be the bog standard: young (self sacrificing) girl in dystopian future becomes the ‘chosen one’ (the divergent/mockingjay) and is protected and given strength by a band of misfits in an underground lair. It’s not all bad. This is a basic summary of the first half of the two hour show. The second half really finds it’s footing so it’s difficult to say whether this is a film that is a slow starter, or one that couldn’t distinguish it’s own identity in a crowded franchise driven Hollywood. 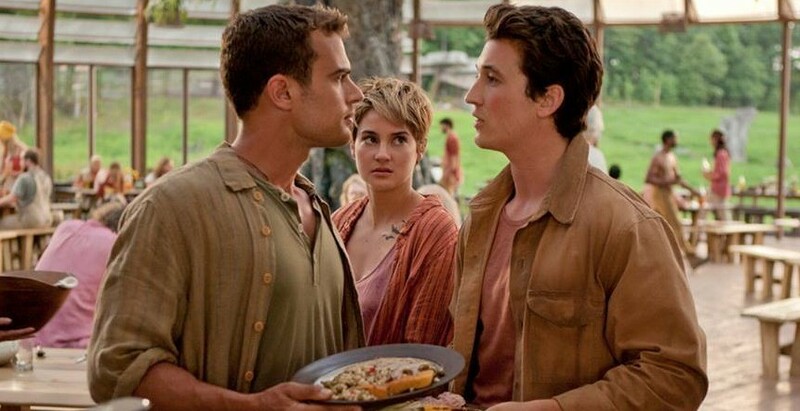 In the second hour there is a noticeable shift: the ‘Divergent’ we loved is back. Our main character begins to struggle with a more tangible demon, and the story seems to be making some sort of progression. It doesn’t seem a coincidence that the most enjoyable parts of this film are those where Miles Teller features heavily: though he provides comic relief, we see a lot of hope for a larger and more significant role in the next films. The positive shift in the film is short lived. A disappointing ‘plot twist’ and resolution remind us that what we are watching is a ‘filler film’ – only serving to add context to future instalments. More disappointment. The action sequences are well shot, and the ‘sim’ sequences are fun: if you’re looking for an action film then this is what you watch for and you won’t be let down. We also have the same audience challenges: ‘Is this still a sim, or is this real life now?’ If you have seen ‘Divergent’ then you will remember this well. Shailene Woodley does fine here. There isn’t anything particularly memorable about her performance, not like in the first film where she stands out as a sure thing for future success. It almost seems that she herself is underwhelmed by what she is given to work with. Theo James is similar: almost symbolically his character takes a back seat for the entire film and serves as an underdeveloped and ‘vanilla’ sidekick. Uncharacteristically, Kate Winslet is also a little vanilla here. Where she usually stands out, she begins to pale. She almost smirks her way through cliche’d dialogue and a plain jane stereotypical villain role. The thrills here come from Teller and Courtenay. Where Teller is providing a laugh track to an otherwise dry script, Courtenay is giving us the villain that Winslet wishes she could be. Whenever Courtenay is in a film we see a little more of something in him that makes us crave diversity. We can only hope that he isn’t typecast into an action star and goes for something a little more ‘meaty’. We can’t help but think that if these two had a little more screen time, we would of been watching a different film. All in all, Insurgent is OK. If you don’t mind the clichés, dry dialogue and unambitious performances then you will have a perfectly good time.